• WITH ONE OR TWO DOSES targeted to specific trailering or performance time, horses are much more relaxed and tractable. • PERFECT PREP EQ EXTREME IS SAFE AND ETHICAL. Contains NO herbs or chemicals to produce a positive drug test. • PERFECT PREP EQ EXTREME IS QUICK ACTING. You can target and control the effects. • PERFECT PREP EQ EXTREME IS HIGHLY CONCENTRATED. Even difficult horses respond. • PERFECT PREP EQ EXTREME PASTE IS PALATABLE AND EASY TO FEED. • PERFECT PREP EQ EXTREME EFFECTS ARE TRANSIENT. Horses return to normal within 12-24 hrs. Various horses may exhibit different levels of effect when fed PERFECT PREP EXTREME. 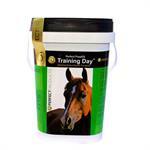 For best results observe response of each horse to 40 ml or 80ml feedings before targeted use. PERFECT PREP EQ EXTREME is effective about 60 minutes after administration. Its quieting effects last up to 6 hours. Horses generally respond to one 40 ml feeding, but excellent results are also reported on difficult horses when the entire 80 ml tube is administered 90 minutes prior to event. Effects last up to 6 hours. PERFECT PREP EQ EXTREME works with PERFECT PREP EQ TRAINING DAY to provide precise, targeted effects for horse shows, trailering and other stressful events. If you are feeding PERFECT PREP EQ TRAINING DAY and wish to quickly increase your quieting effect, one 40-80 ml feeding of PERFECT PREP EQ EXTREME 60 minutes prior to showing is reported to provide the desired effect on most horses. Feeding for effect may be repeated as needed.